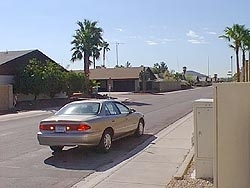 The purpose of this study was to determine if the VDSL system installed in Phoenix, Arizona (USA) is causing significant harmful interference to stations in the Amateur Radio Service. This system was originally installed by US West and is presently operated by Qwest. Actual field strength of radiated emissions levels were not measured, but modern amateur radio equipment was used in a mobile HF station to determine if any noticeable increase of noise level or harmful interference could be observed in neighborhoods with significant installed VDSL service. This was intended to be a preliminary survey, to determine if widespread interference existed. If so, additional quantitative measurements would have been performed. It does not appear that such interference was noted, so no additional testing in this case appears necessary. 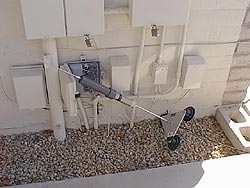 Almost all telephone wiring in the Phoenix area is underground. Most houses in the areas tested are relatively new. Under these circumstances, no significant increase in noise level on the 3.5 or 7.0 MHz amateur bands was observed. In once case, a few dB of noise increase was heard when the vehicle was parked within a few feet of one of the neighborhood distribution units. In one other case, at a residence, a very noticeable increase of noise was observed when the telephone wiring of the residence was deliberately unbalance with a 5 meter piece of wire attached to only one of the two pairs, but this is not a normal condition and if present in a residence (due to a wiring breakage, for example) and would represent a correctable defect. The conclusion of this study is that in an area with underground utilities and generally well-maintained residential phone wiring, it is possible to operate a VDSL system without widespread harmful interference to over-the-air radio services. This does not negate the need for spectral protection in the VDSL standards being developed, however, because it is expected that overhead telephone wiring will radiate much more efficiently than underground wiring. The testing was performed by Ed Hare, W1RFI, the ARRL Laboratory Supervisor. Hare has had significant experience with various types of interference involving Amateur Radio. He is the author of ARRL's book, The ARRL RFI Book. He also serves formally as an alternate on the ANSI C63 RFI standards committee and the Society of Automotive Engineers EMC/EMR committee. 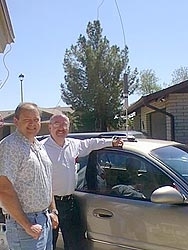 A local Phoenix resident, Randy Brown, of AG Communication Systems, accompanied Mr Hare, to learn more about the test methods used and to help identify neighborhoods with installed VDSL. Representatives from QWEST did not choose to participate in this testing. 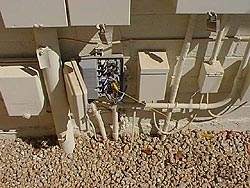 This"pre-standard" VDSL system was manufactured by ** and originally operated by US West. It is now operated by QWEST. It uses wideband QAM modulation in the downstream direction. The downstream band overlaps with the 3.5 and 7.0 MHz amateur HF bands. Nominal psd level of the signal at the transmitter in the 7 MHz band is -60 dBm/Hz, but could be as high as -57 dBm/Hz for very long loops. In the 3.5 MHz band, this may go up to -55 dBm/Hz. Notice that the signal level would drop considerably once it leaves the street cabinet where the downstream transmitter is located, due to the high attenuation characteristics of the twisted pair at high frequencies. Typically, after a few thousand feet, the psd level of the signal is less than -100 dBm/Hz. A Kenwood TS-440 multi-mode HF transceiver was installed in a mid-size rental car. It was used in conjunction with an inductor-loaded HF mobile whip antenna, magnetically mounted on the roof of the vehicle. A short wire was added to the top section to allow it to resonate on the 3.5 MHz amateur band. The station was operated primarily in receive by Ed Hare, W1RFI, ARRL's Laboratory Supervisor. This station is referred to as W1RFI/M in the rest of this report. The initial testing was at the residence of Mr Brown. This residence used Category 5 wiring for all of the VDSL connections within the house. With the W1RFI/M vehicle parked within about 2 meters of the demark point, no noticeable noise was observed. The antenna was temporarily removed and placed close to the telephone wiring. When the tip of the antenna was located approximately 100 centimeters from the telephone wiring, an increase in noise could be heard. This does not represent typical conditions, but was done to allow the station operator to hear what VDSL interference sounds like. In this case, the radiated VDSL signal manifested as broadband noise. This is NOT a typical orientation for any antenna, but the photo was included to show that in this case, with Category 5 underground wiring, it took extraordinary conditions to pick up significant noise. It is a very rough estimate that the downstream VDSL level at this demark point is somewhere near -100 dBm/Hz, although this was not measured on the phone lines. The next test was performed at the distribution box for Mr Brown's address. When W1RFI/M parked on the street right next to this box, a few dB increase in noise could be heard. A few meters away, the noise was inaudible, indicating that harmful interference to any nearby amateur stations was not to be expected. Quite coincidentally, an amateur antenna was observed about 50 meters from the installation. The amateur station belongs to George Lucchi, W6NVN. <At this time, I am still contacting the amateur to ask for firsthand reports about any increase in noise level pre- and post-VDSL -- Ed>. Hare and Brown then drove to a number of neighborhoods where VDSL was installed. Along the way to each of the neighborhoods, and occasionally within them, a number of noise sources were heard. In each of these cases, however, Hare was able to identify the noise from experience, attributing them to power-line noises (tracking insulators, active arcing, etc), harmonics from the horizontal oscillators of TV sets (heard every 15.75 kHz as raucous buzzing, strongest near apartment buildings) and the occasional discrete signal from sundry computer systems, etc. None of these noises had the characteristics of broadband noise heard from the VDSL system installed at Brown's residence. The last test was made again at Brown's residence. With the antenna system installed on the vehicle, parked about 3 meters from the demark point, the phone wiring was deliberately unbalanced by adding about 5 meters of wire to one of the wires in the telephone twisted pair. The distance between the added wire and the mobile antenna was about 2-3 meters. Under these circumstances, strong interference was observed (S9 on the TS-440 signal strength meter, with S9 representing approximately a received signal level of 50 microvolts into 50 ohms. This demonstrates that defects in residential phone wiring or other circumstances that result in more radiation that would normally occur from well-maintained residential phone wiring and underground utilities could result in significant radiated noise. This does, however, represent a correctable defect, but it does indicate that some attention to such defects should be given by those who deploy or install VDSL systems. Although the noise would probably decrease by approximately 20 log(Distance ratio), close amateur stations or those subject to simultaneous radiation from multiple VDSL signals in overhead wiring, could experience some level of interference from such defects. During the course of the test, various noises were heard on the HF transceiver. In most of these cases, Hare was able to identify the source by the sound and tuning pattern. Typical noises appeared to be related to power lines and electrical devices (heard fairly often near some of the medium-tension distribution mains along the route -- much quieter in residential areas), harmonics of horizontal oscillators from TV sets (strongest near large apartment complexes, heard at 15.75 kHz spacing across a wide range of frequencies) and various discrete signals that appeared to be radiation from various computer-type devices. The levels and frequency occurrence of non-VDSL noise may help explain why this type of field test has not been previously performed or reported -- those who were not experienced with the various manifestations of interfering noises would have considerable difficulty sorting out what was being heard from noise generated by VDSL installations. The conclusion of this study is that in an area with underground utilities and generally well-maintained residential phone wiring, it is possible to operate a VDSL system without widespread harmful interference to over-the-air radio services. This does not negate the need for spectral protection in the VDSL standards being developed, however, because it is expected that overhead telephone wiring will radiate much more efficiently than underground wiring. The amateur station used for these tests was not very sensitive and probably represents the minimum station performance to be expected in routine operation. A paper outlining the typical parameters of HF amateur stations was prepared by ARRL and presented in 1996 to T1E1.4.